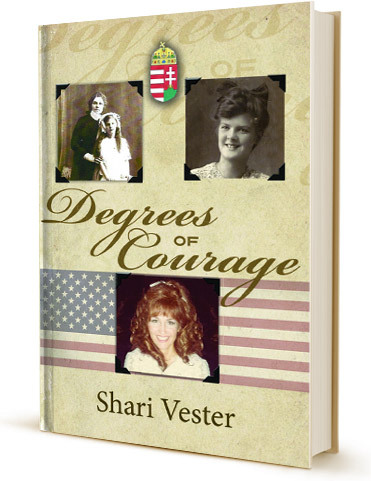 Degrees of Courage tells the story of three women of a Hungarian family, mother, daughter and granddaughter, their lives set against the most dramatic and turbulent decades of the 20th century. From 1900 through 1970, as historic events rumble on, each is confronted with problems beyond individual control, be it turn-of-the-centry Victorian prejudice, devastating wars, or life under a terror-driven regime. To cope, they carried on with equal courage but with vastly different outcomes: one was able to overcome, one was destined to break under pressure, and one turned all to her advantage. Although the story is semi-fictional, loosely based on family history, it also contains strong elements of historical truth familiar to many people, especially to Hungarians who lived through the horrors of WWII and the subsequent Communist takeover that led to a bloody revolt against the hated Stalinist dictatorship. Degrees of Courage is a testimony of what it took to live in an age and time when today’s “Let it be” mentality was simply unimaginable.